The Department of Justice coordinated the largest elder fraud sweep by filing cases and consumer actions related to financial scams targeting or disproportionately affecting seniors nationwide. In their announcement yesterday, the DOJ claimed that their civil, as well as criminal actions, filed with the support of law enforcement, involve claims of three-fourths of a billion in monetary losses and millions of alleged victims. Elder financial exploitation, the illegal misappropriation of an old person’s funds, is destroying millions of lives. News of the DOJ elder fraud sweep comes a month after the Consumer Financial Bureau released a report with data indicating an increase in reported incidences involving elder financial exploitation. While the reported elder financial exploitation prevalence might shock some, our investor fraud lawyers are very familiar with this growing epidemic. 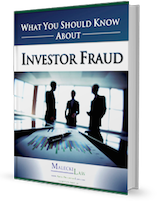 Elder financial fraud manifests in many ways through a variety of scam artists from Ponzi Scheme perpetrators to relatives. The DOJ’s recent prosecution focus is tech support fraud, which is the most commonly reported fraud that the elderly reported to the Consumer Sentinel Network. Other types of popular financial scams affecting seniors are investment schemes, identity theft, internet phishing, grandparent scam, lottery scams and more, according to the National Adult Protective Services Association. Additionally, older individuals lose their life savings, investments or retirement money from unscrupulous brokers or financial advisors. Seniors get conned into making inappropriate investments because of their greater tendency to trust financial professionals. Worst of all, seniors defrauded at broker-dealers do not have the time to remake money earned throughout their lifetime. The Consumer Financial Bureau analyzed data from Suspicious Activity Reports filed between April 2013 and December 2017 to shed more awareness on the issues of elder financial exploitation. Broker-dealers and other financial institutions file suspicious activity reports with the U.S Department of Treasury’s Financial Crimes Enforcement Network (FinCEN) in compliance with the federal Bank Secrecy Act. The study found that suspicious activity reports referencing financial exploitation quadrupled within these few years. In 2017, the financial institutions reported $1.7 billion in 63,500 suspicious activities reports. The average loss indicated on elder financial exploitation suspicious activities reports was $34,200, but that amount varied depending on the type of account, specific age group, and other factors.